"Our idea is to use light to engineer these materials in place," says Tobias Grass, a postdoctoral researcher at the Joint Quantum Institute (JQI) and a co-author of the paper. "The big advantage of light is its flexibility. It’s like having a knob that can change the physics in your sample." The proposal suggests a method to alter a physical effect that occurs in flat materials held at very low temperatures and subjected to extremely strong magnets—at least a thousand times stronger than a fridge magnet. Under these circumstances, electrons zipping around on a two-dimensional landscape start to behave in an unusual way. Instead of continuously flowing through the material, they get locked into tight circular orbits of particular sizes and energies, barely straying from their spots. Only a certain number of electrons can occupy each orbit. When orbits are partially filled—which gives electrons some room to breathe—it activates new kinds of interactions between the charged particles and leads to a complex quantum dance. Electrons carry out this choreography—known as the fractional quantum Hall effect—in graphene. 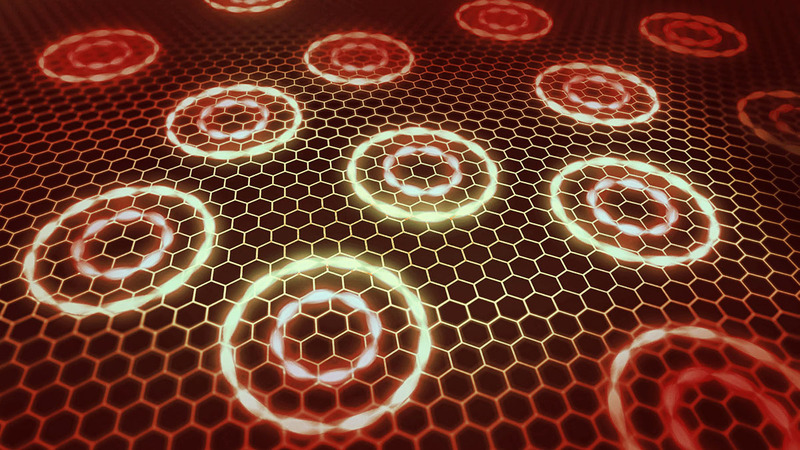 Interestingly, tuning the interactions between electrons can coax them into different quantum Hall dance patterns, but it requires a stronger magnet or an entirely different sample—sometimes with two layers of graphene stacked together. The new work, which is a collaboration between researchers at JQI and the City College of New York, proposes using laser light to circumvent some of these experimental challenges and even create novel quantum dances. The light can prod electrons into jumping between orbits of different energies. As a result, the interactions between the electrons change and lead to a different dance pattern, including some that have never been seen before in experiments. The intensity and frequency of the light alter the number of electrons in specific orbits, providing an easy way to control the electrons’ performance. "Such a light-matter interaction results in some models that have previously been studied theoretically," says Mohammad Hafezi, a JQI Fellow and an author of the paper. "But no experimental scheme was proposed to implement them." Unlocking those theoretical dances may reveal novel quantum behavior. Some may even spawn exotic quantum particles that could collaborate to remain protected from noise—a tantalizing idea that could be useful in the quest to build robust quantum computers.